Revelation 22:3 says about New Jerusalem “the throne of God and of the Lamb will be in it, and His slaves will serve Him.” In human society slavery is not good, but to be slaves of God (and also sons of God) is our eternal destiny. 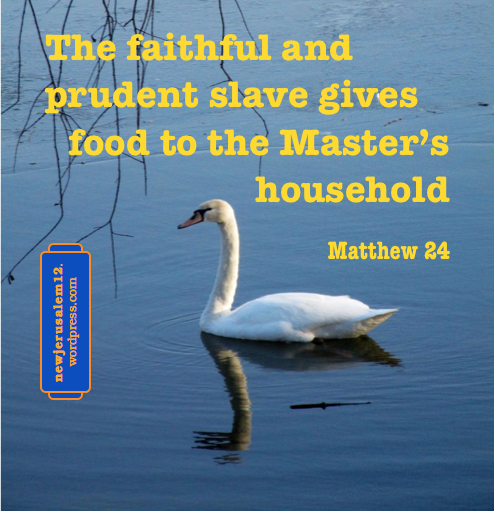 Let us review the divine slavery as revealed in the New Testament. Paul, James, Peter, and Jude all began epistles calling themselves slaves of the Lord. Paul also referred to Timothy, Epaphras, and Tychicus as slaves of God. All of these labored to prepare us for New Jerusalem. In parables in Matthew 13, 24, 25 the Lord Jesus portrays all His New Testament disciples as His slaves and Himself as the Master. In Matthew 20:27 He said, “whoever wants to be first among you shall be your slave.” And in Acts 2 is God’s promise to pour out His Spirit upon his slaves. These verses indicate that we are slaves of God both in this age and in New Jerusalem. We must give ourselves to serve God and learn how to serve. An example to us is the faithful and prudent slave in Matthew 24 who gives food to God’s household and does not eat and drink with the drunken. This food nourishes us to grow in the divine life. We Mature in Christian Life to Match New Jerusalem.